This article submitted by Linda Stelling on 8/11/98. Troy and Rachel Gilbertson, rural Paynesville, are the new owners of PJ’s TV and Appliance, Paynesville. 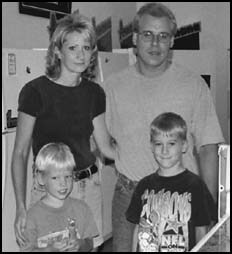 A 1986 graduate of Paynesville Area High School, Gilbertson graduated in 1988 from the North Dakota State College of Science in Wahpeton, N.D. He earned an associate’s degree in applied science and a degree in refrigeration and air conditioning technology. Through continuing education courses, Gilbertson is certified to work on refrigerant transition, Manitowac ice machines, Amana and Maytag appliances, TVs, VCRs and more. Gilbertson has worked the past 10 years at Smith Appliance in Litchfield and decided now was the time to own a business. “I wanted a change, and Rachel (a stay-at-home mom) wanted to get out and do something more. We decided the time was right for us to become our own bosses,” he said. PJ’s hours will remain the same, 9 a.m. to 8 p.m., Monday through Thursday, and 9 a.m. to 9 p.m. on Friday and Saturday. Rachel will be manning the front counter, appliance sales, and the video rentals while Troy keeps busy doing repair work and satellite dish installations. Wayne and Pat Hanson will continue to work in the store for awhile as will Mary Kay Mackedanz. “It’s going to be a challenge owning our own business,” Gilbertson said. They e have two children, Nicholas, 8, and Trevor, 5.